In the background of this corporate mainstream media enjoyed reporting on a coup d’etat in Eritrea reporting that dissident soldiers had taken over. First published out of Qatari-owned Al-Jazeera the story swept the globe to the total amazement of Eritrea as the coup never actually took place. The fabricated story highlights incompetence within the Al-Jazeera network and also the distinct lack of independent checks carried out by Western mainstream media groups that include the BBC. Eritrea lies in a strategic geo-political position for Western interests bordering Ethiopia and just across the Red Sea from Saudi Arabia and Yemen. Press TV has interviewed Tesfamicael Gerahtu, Eritrean Ambassador to UK and Ireland, about this issue. The following is an approximate transcription of the interview. Press TV: Let’s begin at the start of this story. Gerahtu: Thank you for inviting me. There was no coup d’etat in Eritrea. There was no movement of the army, there was no instability at that time, it was a normal day. Of course, without the knowledge of the army unit, the small army unit’s knowledge, some 3 or 4 office leaders took them to the TV station and they told them that they would be guarding the television station. They didn’t know anything. So, in the proper sense there was no coup d’etat. It was not a movement of the army and the best thing is that it was handled properly. Press TV: They read out a statement didn’t they – one of the main presenters read out a statement on air on Eritrea TV the Eritrean international television station? Gerahtu: Well, that didn’t happen. Immediately the whole television and radio station was technically shut – once they knew they were threatened. So nothing has happened. I think there was no coup d’etat, the coup d’etat was not in the real Eritrea. The coup d’etat was in the image of those who wanted to see instability in Eritrea. 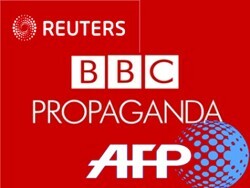 This was made to spin by the corporate media with three aims: one was to wage psychological warfare on Eritrea and Eritreans; and two, a disinformation campaign so as to create chaos and disorientate the population…; and the third issue is having failed with all the attempts made of various conspiracies and many other acts of instability, may be they thought this a time through this small incident to break the resilience of the Eritrean people and the Eritrean government. Press TV: You talk about that news media. Qatar is actually quite friendly to the nation of Eritrea, strong ties in some sense. You’d be surprised that Al-Jazeera covered the Eritrea coup-d’etat, which kind of didn’t aheppen as you were saying. Were you surprised by it? Their basic coverage was, this is the most secret nation in the world, the most corrupt nation in the world, the nation that imprisons journalists – basically the worst nation in the world and finally there are some signs of freedom. There are reports you’re banning Al-Jazeera in Eritrea now? Gerahtu: Let me start with a final point. I think all these hostile elements depend on three things: one is fabrication after fabrication and telling lies to the people to every corner of this world to create a negative image of Eritrea; and the second thing is they always try to threaten especially Eritreans through various means; and the third important thing is that they do destructive things. The media is trying to reproduce this. Yes we do have good relations with Qatar, but Al-Jazeera has been rampant in terms of trying to reproduce, multiplying this imaginary, virtual coup d’etat, which did not happen in Eritrea. It’s the same with all the other corporate media and that’s why I always talk about alternative media reality, the alternative media outside of the mainstream so that the truth is reflected in a constructive way rather than destructive. But the point you raised about Al-Jazeera being banned in Eritrea – that’s another a lie because Al-Jazeera has become a black spot now in terms of everybody who wants to know the truth. Press TV: The BBC was very quick to headline an attempted coup; a lot about the imprisonment of journalists, activists; figures of 10,000 people that 10,000 Eritreans are basically in boxes being imprisoned. How do you answer all those questions? Gerahtu: First of all, because of the nature of this small thing that happened, which was not a coup d’etat, we never gave any information or any interviews on media. I think I’m doing it with you not to talk about it, but to talk in general about many other things and especially about the way the media is trying to play games in terms of reproducing this in a very destructive way. But to come back to your question, these 10,000 political prisoners. Let alone political prisoners, Eritrea doesn’t even have one tenth of this number in total prisoners on the basis of crimes. This is totally fabricated. Press TV: What about these human rights groups saying then, why can’t you let them have access to check it out for you, instead of you checking them out. Gerahtu: The thing is that the small number who have been imprisoned have been imprisoned not because of reforms or political issues, but in matters relating to national security during the war situation with Ethiopia. And that has not been settled up to now because Ethiopia with the open support of the United States continues to occupy our sovereignty in defiance of international law. Press TV: Is that the case with the Swedish journalist as well? Gerahtu: Yes it is the same case. Press TV: President Obama’s second term, Susan Rice couldn’t get the Secretary of State’s job, what are you holding out for in terms of hopes because as recently as about a year ago there were signs of Obama’s, defacto-Obama’s troops on your Ethiopian border attacking your country? Gerahtu: The United States has been backing Ethiopia in so many different ways. The important things is that… are we hopeful about the second term of Obama? We are always hopeful that the United states will take a sober position in terms of its relationship with Eritrea and the countries in the region. For two reasons: one, the Eritrean people and the Eritrean government have never been enemies, or we never consider the United States as our enemy; Two, if the United States has been active in the Horn of Africa in the way that it did, including trying to target Eritrea for the sake of strategic interests, no… that’s not the way to promote the strategic interests of the Untied States. Press TV: Still, that pressure is nevertheless on the nation of Eritrea, on its personnel – people like you; the information minister we heard, one of the big names in the Eritrean government in one sense – Where is he? Reports of his disappearance or defection. Are you worried about defections within your government? Gerahtu: There are always defections from governments, from administrations, resignations and so on, big or small. This country has become deepened in so heavy sacrifices because of the subject role of the people, the responsibility of the people and the way we try to create a people’s capacity and empower them so that they become masters of their fate. It’s not about personalities. If that had been the case – many leaders from the liberation struggle defected to Ethiopia, to Sudan, and Europe. Even after independence many did that so this is not something new, it will continue like that. I think if we rely on the power of the people, which we are doing and which we will continue in the future, that’s what nation building means. 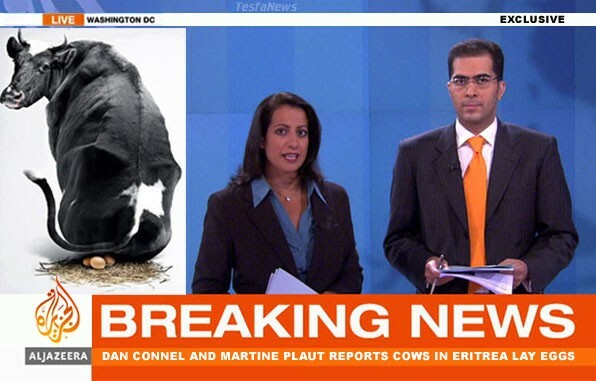 Hostile media tarnish Eritrea image. Is Al-Jazeera that much incompetent? A call for action from Eritreans all over the world is gaining momentum. As the case against all the perpetrators and criminal gangs that violate our sovereignty by invading and vandalizing our foreign embassies have been compiled and set to go for trial. The poor souls wouldn’t know what hits them. We’ll see if they are going to hide behind the wet pants of Dan Connell and Martin Plaut this time. The real revolution begins and it starts first by exposing and isolating the prime targets and perpetrators before it consume each and every other criminal that passes a stone. Yes. This must be done. I hate these kinds of people more than I hate the weyanes or their western handlers. Please London Eritreans, don´t let them off the hook. Make them cry blood. This vampire looking biatch called Selam Kidane must be punished like her father and husband (the derg soldiers) were punished back home. TesfaNews, that was hillarious but true. AJE with out even cared to verify reports that retweeted to it as facts and publicized to later find it fake and bogus info. I am hoping they have learnt the hard way. Eritrea is not Libya or Syria where you can incite violence in a tweet or reports on Television screen. ሕጂ ዶ ‘ሓይሽ ዋይ ዋይ! Hiji do ‘Hayish, wai wai ! ሕጂ ዶ’ሞ ‘ሕሾ ታሪኹ እንሀለ ! ህዝበይ እዞም ሰባት መን ,ዮም??? ?